These are the last poems ever written at Batoche; technically, Batoche no longer exists. In the summer of 1983, the federal government announced it was spending six million dollars to develop the Batoche museum. Then, on Remembrance Day 1983, Canada Post closed the Batoche Post Office at Chenier's Store. Permanently. There was no public protest. There were 700 people on the lists of the post office at Batoche in 1885; 700 people now almost forgotten. These poems are made up of their rumours, innuendo, gossip, news, and dreams; a sort of Spoon River Anthology with politics. The histories are deliberately incomplete. There are some stories I didn't tell, stories that could be told better in prose. In particular, I'm thinking of dashing Jack French, who charged down the hill with the Union Jack, rattled up the stairs of Batoche's House, flung open the sash, and as he shouted "Thus to all rebels" as an encouragement to his troops, was shot dead by Donald Ross. As to Monsieur Ross's fate, Captain Peters has a photo labelled "He Shot Captain French," which shows Ross in pin-stripe trousers, the rigor mortis setting his features in a grin; not as dusty as he should be for an old man who's been shot, bayoneted, shot again, and then dragged through town with a rope tied to the tail of a horse. 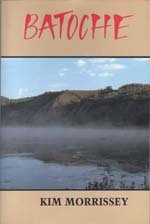 This collection is for the people of Batoche who had no voice, people who just put their heads down and lived on, under the benevolence of a government they could never quite trust: people like Madame Riel, who faced her husband's death, and her own with quiet dignity. She was left with a three-year-old son and a one-year-old daughter. She was expecting a third, which she miscarried because she was starving and in the last stages of tuberculosis. This collection is also for the people I have known at Batoche: for Charlie Cox and for his wife Darlene, president of the local Métis Association when I knew her, for Jimmy Fiddler and his race horses, for Clarence Grenier who told me about his great-grandmother watching Middleton's troops march through her kitchen, for Octave Fiddler, who can fix anything. This is also for Patrick Lane, Brenda Niskala, John Barton, Peter Jay and Daniel Weissbort, who have helped shape my poetic sensibilities. But mostly, it is for Roy Morrissey. Other poets who have struggled with historical reconstruction know it is not enough to know the facts, you must go away and dream. Roy allowed me eight years to dream, and work alongside him on our farm near Batoche; eight years to think and rethink the Resistance of 1885. One final footnote: when I think of the conflict, I think of "Gentleman Joe" MacKay at Duck Lake, bumping his horse into Gabriel's, hooking the bridle with his gun, shouting, "One step further and I'll kill you" and Gabriel's reply: 'You kill me. I'll slaughter you." I like that. I think Gabriel did too.